January 1, 2016 brought changes to federal fishing regulations in the South Atlantic! Click on the image to download the fact sheet! The South Atlantic Fishery Management Council reminds commercial and recreational fishermen about several fishery openings and closures in federal waters of the South Atlantic effective January 1, 2016. There are several ways to stay up to date on fishing seasons, openings, and closures throughout the year. - Keep up with closures as they happen throughout the year by visiting our Fishing Season Calendar & Closure page. 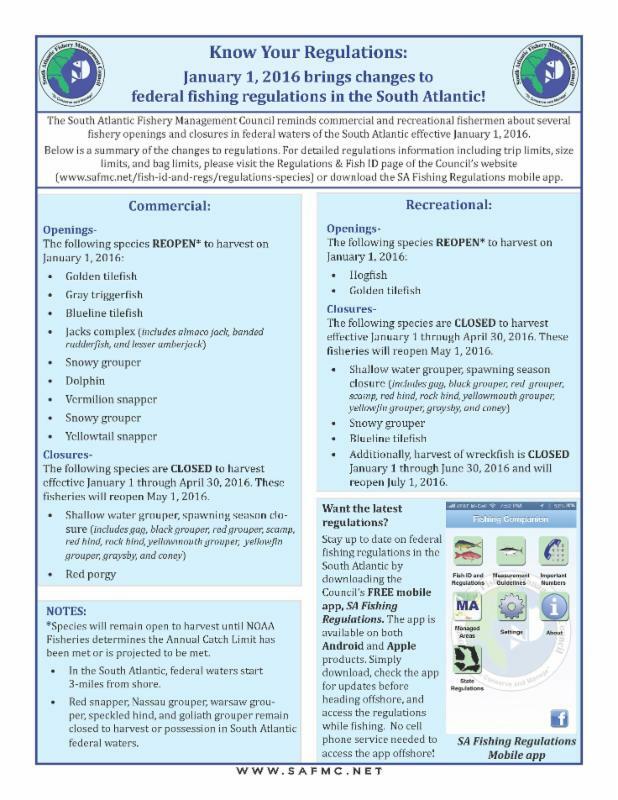 Want to stay up to date on federal fishing regulations in the South Atlantic? Download the Council's FREE mobile app, SA Fishing Regulations! The app is available on both Android and Apple products. Simply download, check the app for updates before heading offshore, and access the regulations while fishing. No cell phone service needed!